Whether used in a hospital or in the field, the new ZOLL AED Pro® is designed to perform in any environment. It provides the ruggedness, portability, and advanced functionality that professional rescuers and services require from an automated external defibrillator (AED). 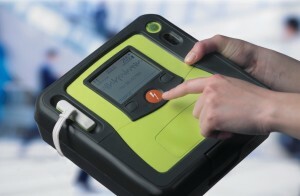 The AED Pro has a robust design with rubber over-moulds, built to withstand harsh environments. It is extremely resistant to dust and water jets and is the only AED in the industry to withstand a 1.5 metre drop test, making it a great choice for emergency medical transfers. It has automatic self testing to ensure a constant state of readiness. Designed with advanced capabilities, the ZOLL AED Pro supports Basic Life Support as well as Advanced Life Support professionals. This advanced AED features a high-resolution LCD display that allows responders to visualize a patient’s ECG while utilizing a 3-lead monitoring cable. It can be used in a semi-automatic mode for single operators with manual override for ALS professionals and has Intelligent Paediatric capability with pedi-padz®II Paediatric Electrodes enabling it to function well for paediatric patients as well as adults.